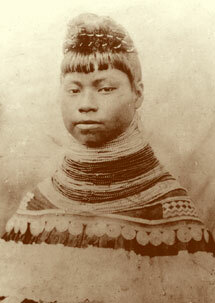 Studio photograph of Ruby Tigertail, Charlie Tigertail's sister in traditional dress wearing multiple strands of beads. Circa 1920. Southwest Florida has been shaped and reshaped by centuries of shifting sea action and limestone build-up. During the Ice Ages, each time the polar ice sheets reformed and lowered the surrounding sea level, another layer of sand and shell was deposited, creating the limestone and sandy sediment that lie beneath much of Collier County today. This gradual building process continued until about 25,000 years ago, when the southern tip of Florida was flooded by tropical seas for the last time. Rich fossil finds show that this region was once home to camels, mastodons, mammoths, saber-toothed cats, and huge herds of bison, deer and wild horses. The animal population reached its peak during the Pleistocene Period about 10,000 years ago, when the number and variety of animals here approached that of the big game region of the African Serengeti. Gradual changes in climate, vegetation and habitat contributed to their extinction. The first humans reached Southwest Florida at least 10,000 years ago, when the climate was colder and drier. Living in small, widely scattered bands, these first Floridians or Paleoindians, survived by hunting and fishing and by gathering wild plant foods. The descendants of these hardy Paleo hunters eventually settled into more permanent communities and evolved into one of Florida’s most distinctive and highly developed Native American civilizations – the Calusa. Centuries before Columbus landed in the Americas; Florida’s lower Gulf coast was controlled by the powerful Calusa Indians. Once numbering as many as 10,000 people, the Calusa were ruled by a single chief or cacique, supported nobility and standing army, engineered canals, built huge mounds of shell and earth for their temples and important buildings, and collected tribute from a vast empire of towns and villages reaching all the way across south Florida to the Atlantic. Highly skilled Calusa artists also created elaborate masks and wooden carvings for religious and ceremonial purposes, such as those discovered by archaeologist Frank Hamilton Cushing on Marco Island in 1895. Juan Ponce de Leon discovered and claimed Florida for Spain in 1513 and led the first recorded European exploration of the Gulf coast. He returned to colonize Southwest Florida in 1521, but was driven off and mortally wounded in a battle with Calusa warriors. Other Spanish explorers and adventurers attempted the conquest of Florida over the next forty years. The expeditions failed, but decades of warfare, enslavement and epidemics of infectious European diseases ultimately destroyed the Calusa and their cultural heritage. By the early 1700s, small bands of Creek Indians from Georgia and Alabama began making their way into Florida to hunt, farm and herd cattle. Eventually, these breakaway groups of Indians joined with escaped black slaves and refugees from other tribes to forge a new identity known as the Seminole. By the time the United States acquired Florida from Spain in 1821, there were an estimated 5,000 Seminole living in the territory. Ongoing disputes and border skirmishes with white settlers ultimately led to government pressure to move the Seminole to reservations west of the Mississippi River. Between 1817 and 1858, the U.S. Government fought three long, costly and tragic wars to remove the Seminole from their Florida homes by force. Although vastly outnumbered, Seminole war parties fought the Army to a stalemate during the Second Seminole War, making it the bloodiest and most expensive Indian war in U.S. history. A chain of forts along the fringes of Collier County were reactivated when a third and final fight with the Seminole broke out in 1855. The few surviving Seminole found refuge deep in the Everglades and Big Cypress Swamp where they developed a culture uniquely suited to the climate and terrain of south Florida. Southwest Florida remained virtually uninhabited until after the Civil War when a handful of settlers began drifting south to rebuild their lives on the raw Florida frontier. The first arrivals were squatters who made their way down the peninsula during the 1870s and 1880s in mule wagons, ox carts or sailboats. They settled mostly along the coast, often starting out in a makeshift palmetto shack. Strongly self-reliant, these early pioneers fished and hunted for a living, raised crops of cabbage, peppers, tomatoes, sugar cane and pineapples, dug clams and oysters, made charcoal, sold bird plumes, and trapped otters and alligators for their pelts and hides. Trading posts started by Ted Smallwood on Chokoloskee Island and George Storter at Everglade, became important gathering places for the few isolated settlers and Indians living on the south Florida frontier. By the late 1880s, Naples and Marco Island were already gaining popularity as winter resorts for wealthy Northerners and sportsmen. Cattle ranching are one of Collier County’s oldest industries. Native Florida scrub cattle were the descendants of cows that had strayed from herds the Spanish had brought to the New World in the 1500s. During the Civil War, Florida cow men supplied the Confederacy with cattle and also carried on a lively cattle trade with Cuba. By the early 1900s, ranchers like Bob Roberts, Jehu Whidden and Robert Carson were grazing herds of scrub cattle on the open prairies and grasslands around Immokalee. Railroads improved access to market in the 1920s and helped raise the County’s beef cattle industry to national importance by the end of World War II. The term “cracker” is said to have come from the crack or popping sound made by the cattlemen’s braided leather whips as they worked their herds. Collier County’s creation in 1923 and its early economic growth were closely associated with Memphis-born millionaire, Barron Gift Collier. With his fortune from streetcar advertising, Collier introduced paved roads, electric power, telegraphs, telephones and countless new businesses and homeowners to Florida’s last frontier. Railroads and the completion of the Tamiami Trail in 1928 also began to unlock the region’s enormous agricultural and resort potential. Florida’s first commercial oil well was drilled at Sunniland in 1943, and Collier County’s cypress logging industry flourished at Copeland well into the 1950s. World War II introduced hundreds of servicemen and their families to Naples and Collier County when the U.S. Army Air Field (now Naples Airport) was activated in 1943 to train pilots for combat in Europe and the Pacific. At the height of the war, several hundred men and 75 aircraft were assigned to the Naples base. Many veterans returned to Southwest Florida after the war as prospective homebuyers and businessmen. Tourism boomed 200% in 1955 as better rail connections, air travel and dramatic improvements in the state’s road system gave seasonal visitors greater access to Collier County. A direct hit by Hurricane Donna in 1960 caused millions of dollars in property damage, but actually stimulated Naples’ growth with an infusion of insurance money and low interest loans. In the short span of only fifty years, the number of County residents swelled from 6,488 in 1950, to an astonishing 251,377 today. The County seat was transferred from Everglades City to East Naples in 1962, and signaled a new era of sustained prosperity and growth in agribusiness, tourism, construction and real estate that have made Collier County one of the fastest developing areas in the nation.